The Democratic Governors Association joined Vermont's gubernatorial race Wednesday with its first advertisement backing former transportation secretary Sue Minter. The ad, which is running on broadcast, cable and satellite television, compares Minter's education policies with those of her Republican rival, Lt. Gov. Phil Scott. 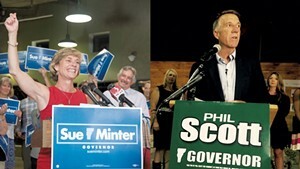 Its narrator claims that the Democratic nominee would make college more affordable, while Scott thinks Vermont spends too much on education. The group behind the ad, Our Vermont, is an independent-expenditure political action committee — or super PAC — funded entirely by the DGA, a Washington, D.C., organization devoted to electing Democratic governors. A spokesman for Our Vermont, Sterling Clifford, says the group will spend $150,000 to run the ad through September 19. In that same period, according to Clifford, a super PAC funded by the Republican Governors Association is slated to spend $132,000 on television advertising. "We are committed to doing whatever we can to help elect Sue Minter," he said. "We think she's a great candidate. We're confident she's in a good position to win this race, and we intend to do everything we can to make that happen." The DGA's first ad buy comes four weeks to the day after the RGA entered the fray. As of last week, the RGA's super PAC, called A Stronger Vermont, had already spent $523,000 backing Scott. At that point, the Democratic super PAC had spent just $11,000. "Obviously they feel like they've got a lot of work to do to build up their candidate," Sterling said of the RGA's early ad buy. In a press release issued Wednesday, Vermont Republican Party executive director Jeff Bartley referred to Our Vermont as "Peter Shumlin's super PAC," referring to the incumbent Democratic governor. Shumlin was chairman of the DGA in 2013 and 2014 and currently serves on its executive board. His former chief of staff, Bill Lofy, is a consultant to Our Vermont. "Peter Shumlin and his super PAC know the only way to cover up the devastating economic impact and crisis of affordability left by six years of one-party rule is to help elect Shumlin's hand-picked protégé," Bartley said, referring to Minter, who served nearly five years in the Shumlin administration. Corrected at 7:05 p.m.: An earlier version of this story mischaracterized Shumlin's current role with the DGA. He serves on its executive board.